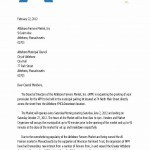 Here are the two letters submitted to Attleboro City Council (In PDF and JPG formats). 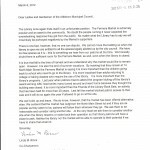 The first letter is by the Attleboro Public Library Co-Chairman of the Board of Trustees and the other by the Attleboro Farmers Market President/Manager and Vendor Coordinator. These are the two letters that Councilor Jay DiLisio and a special sub-committee will have in front of them as they begin to put together their recommendation to the full Council. 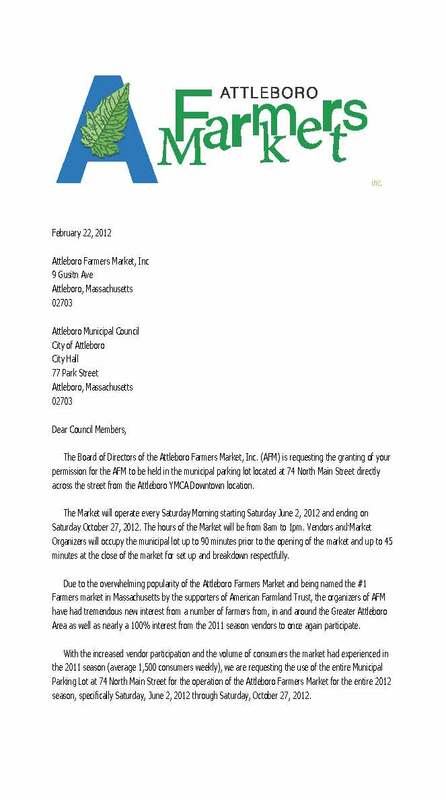 They will also like to hear or read any comments from Attleboro residents. A list of the City Council is available on the City’s website CLICK HERE FOR LIST. It sounds like the farmer’s market is attempting to cast this as “farmers market vs the library” with the library as the villain. That is unfortunate; I’m sure there’s plenty of room for both institutions within the city of Attleboro. I can think of a few other city owned spaces which could provide ample room for a farmer’s market — Willett Elementary School, just a little bit down the road; the municipal lot behind the YMCA, the soon-to-be-vacant lot where the Old Barn was, Capron Park, and the High School parking lot all leap to mind. However, I can think of precisely zero alternatives for the Library. There’s no need to a “Let the People Decide” campaign. 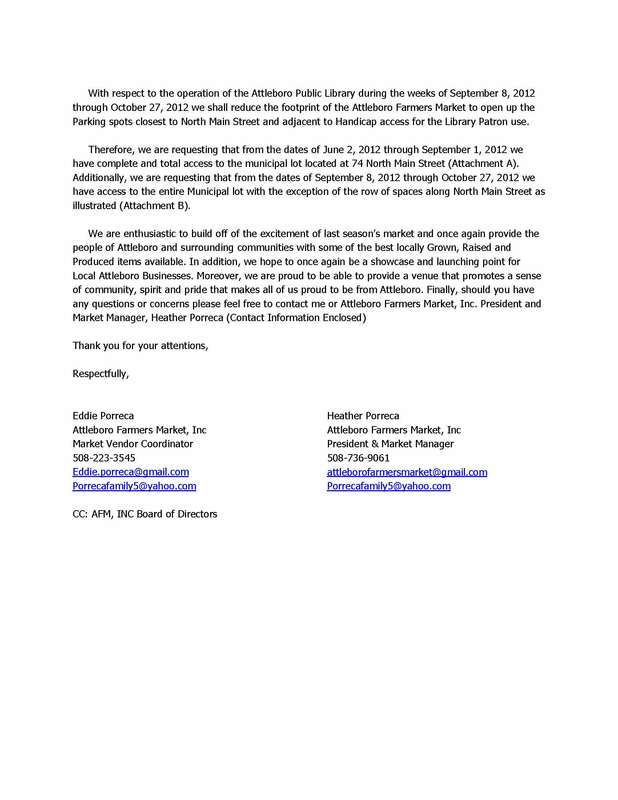 The Farmers Market is undoubtedly so popular that relocating won’t be the end of the world. The Providence outdoor farmer’s market thrives on a small bit of space at the end of Blackstone Boulevard with zero parking, and it relocated a few years ago from it’s original location. People found it, no biggie. Please don’t try to make the people of Attleboro pick a side here; I suspect the Farmers Market would be on the losing side of the argument, no matter how much we all like farmers. You’re right, we don’t want this to be an us vs. them and the headline of the post does suggest it. Since the letters were not posted by The Sun Chronicle we thought they should be available. Thanks for your suggestions for alternate sites. If the library is open, they should be entitled to all of the spots legally allotted to them. Period. Like they said, they don’t have the flexibility to pick up and move the building, unlike the FM, which can find another location if need be. 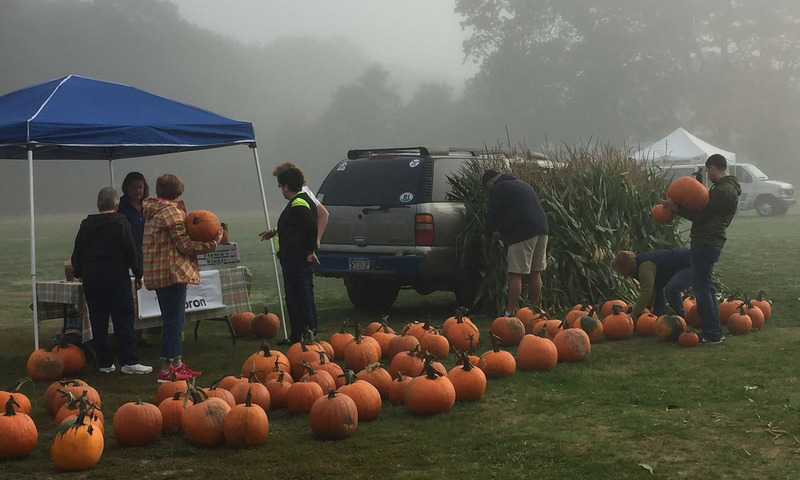 Accessability to the public library and everything in it that benefits the school children, seniors and general citizens of Attleboro by far outweighs a seasonal farmers market that finds itself doing better business than expected. Aaron had good alternative spots – if you can’t be flexible with regard to the Library’s concerns, find a spot you can make work elsewhere. I agree that there are plenty of empty spaces right near the center of town that people would be willing to go to an alternative spot. I love going to the farmers market and would follow it to a different location in Attleboro. AFM and the Library overlap services for 4.5 hours on 8 Saturday mornings (September to October). That’s it. The Library is closed Saturdays from Memorial Day to Labor Day. All vendors clear the lot by 1:15, and the library is open until 4pm. We did not experience parking shortages, as we encourage our patrons to walk or bike to the market. If they needed a car, we directed them, through the use of social media and press releases, to park elsewhere. There is ample parking available for patrons to utilize BOTH services. The “drastic shortage” of parking simply doesnt exist. Let’s remember the lot is a Municiple Parking lot that serves many uses during the week. The YMCA, Courthouse, Balfore Riverwalk Park to name a few. The turn over in the lot is swift and neither AFM, nor the Auxillary Police that were on site every week the Library was open ever heard any complaints. Please let me be clear, we are huge supporters of the Library. 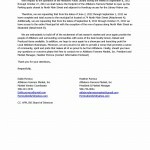 We would love nothing more than to work with them again to promote their programs and continue to co-sponsor them as well. We were thrilled to be part of the Big Read fence painting that took place on Sept 10th. We helped promote the program to our patrons. We provided the Library with tents and tables right in the middle of the market to give away the book “Tom Sawyer” and for the games and crafts that were the highlight of the day. We are saddened by the recent turn of events and the hostility that seems to exist. The City has not offered any other locations that would be sufficient for the more than 1500 people that visit the market weekly. We have asked for many of the suggestions that have been stated in previous posts, but have been denied. Perhaps the Library may want to capitalize on all of these potential “new” library patrons that are right outside their front door. The Board of Trustees are waging quite a battle to preserve the parking spaces of the current patrons, but seem to be missing the potential of expanding their customer base. Hundreds of new patrons are right outside their door, why are they not embracing them and showing them how wonderful our City Library is? We have the ability and the capacity to overlap 2 great services in the community, lets embrace it. It is unfortunate that the “us vs them” mentality is the focal point of the current dispute. The AFM and the Attleboro Library both serve the community. The parking lot is a wonderful spot for the AFM due to the access by car, foot, bike or bus. In addition the businesses of downtown get a boost from the traffic the AFM generates. It would be in everyone’s best interest to share the lot for the months of September and October. Let’s hope the wonderful contributions of both establishments far outweigh the need for dispute and sharing the lot during Sept and Oct will happen again this year. Remember, it is all about Attleboro! I’m a huge supporter of the library and go there once or twice a week, but they are simply being completely foolish about this. It’s not that surprising that they’re a little backward thinking, since I tried to email them to let them know my stance on this issue and they don’t even seem to have a working email address, which for 2012 seems a strange position for an institution. 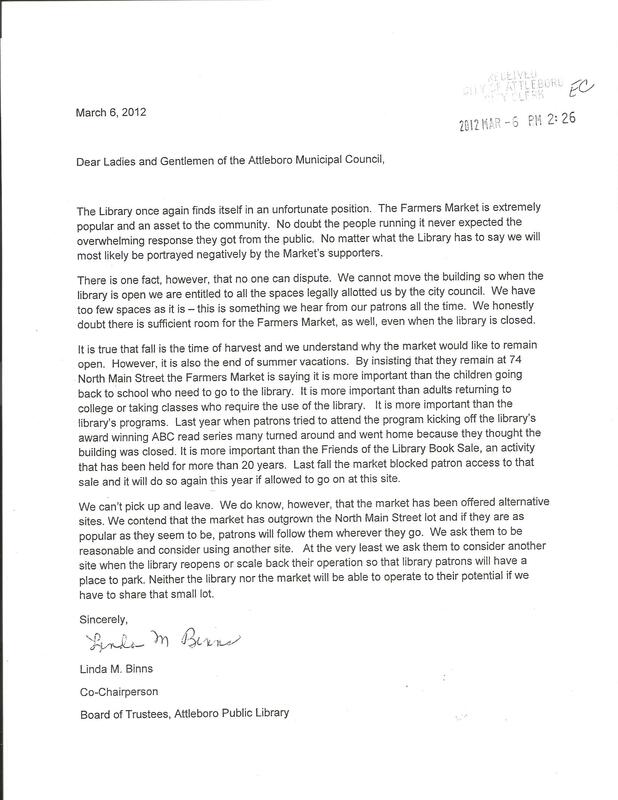 All else aside, I hate to see this become us vs them as well, but if I’m forced to choose sides I’ll back the Farmer’s Market people 100%–why the library is unable to see the benefit for the community and the possible benefit for themselves as an institution is completely mystifying. Previous PostPrevious Congratulations to our Persons of the Year!